Almost three months after D-Day British troops, assisted by mem­bers of the Bel­gium resis­tance, entered Ant­werp on this date in 1944. Opening the Bel­gian port, whose 10 square miles of docks, 20 miles of water­front, and 600 cranes were 80 miles from open sea on the Scheldt River, was meant to solve the “supply famine”—the logis­tical prob­lems of over­extended supply lines caused by the Allies’ break­neck drive to Ger­many. (In France, the Ger­mans still held the ports of Calais, Bou­logne, Dun­kirk, and Le Harve, which in Allied hands would have gone a long way in easing supply short­ages of every sort.) But scarcely had the first Allied forces secured Ant­werp, unus­able due to Ger­mans holding the Scheldt Estuary, than Adolf Hitler un­leashed his hither­to sec­ret wea­pon on the city—the V‑2. Flying at more than four times the speed of sound, the V‑2 bal­listic mis­sile could not be shot out of the air by air­craft or anti-aircraft bat­teries as happened occa­sion­ally to the crude V‑1 buzz bomb (aka doodle­bug) over Eng­land. With a range of 200 miles, the 46‑ft‑tall, 12‑ton V‑2 im­pacted with­out warn­ing and its 2,200 lb of high explo­sives left a giant crater on landing. The Allies tried bombing the mobile V-2 launch sites in occu­pied Holland to little effect. 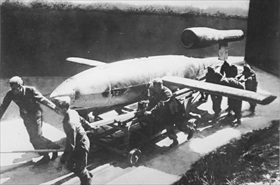 Next it was decided to make a north­ward dash, by means of a series of para­chute drops deep into Holland, to over­run the launch sites that laid waste to Europe’s cities, and then cut off the Dutch coast from Ger­many, capture Ger­many’s indus­trial heart­land, and make a rapid advance to Berlin. Code-named Opera­tion Mar­ket Gar­den (Septem­ber 17–26, 1944), the scheme was a dis­aster. More than 6,000 of the orig­i­nal 35,000 air­borne troops sent to seize the bridges near Arn­hem on the Rhine river were taken pris­oner; nearly 1,500 were killed or died from their wounds. Field Marshal Sir Ber­nard Mont­gomery, who had con­ceived the opera­tion, evoked Wil­liam Shake­speare’s Henry V at Agin­court, France, cen­turies ear­lier when he remarked: “In the an­nals of the British Army there are many glorious deeds. . . . In years to come it will be a great thing for a man to be able to say: ‘I fought at Arn­hem’.” The V‑2 launch sites, never reached by the men at Arn­hem, con­tinued to rain down deadly missiles on Antwerp to the end of the war. Left: Against the V‑1 threat the British deployed belts of anti-air­craft bat­teries on the south and east coasts of Eng­land. In mid-June 1944, during their first week of deploy­ment, AA guns destroyed 17 per­cent of all V-1s entering the engage­ment zone. The figure rose to 74 per­cent in the last week of August, when 82 per­cent were shot down in one day. New ammu­ni­tion, prox­im­ity fuses, and radar-con­trolled guns proved effec­tive. None­the­less, of roughly 10,000 V‑1s fired at England, 2,419 reached the Brit­ish capi­tal within five minutes of launch, killing 6,184 people and injuring 17,981. Right: The Meiller trailer, a wheeled trailer chas­sis and hydrau­lic lifting frame, was used to transport V‑2 rockets to their firing stands and to act as the service gantry for fueling and launch prepa­ra­tion. When ver­tical, the rocket was sus­pended above the firing stand, which was raised to touch the rocket fins. Most V‑2s were launched using mobile equip­ment con­cealed in wooded areas hidden from Allied air­craft. But the Ver­geltungs­waffe‑2 (retali­a­tion/retri­bu­tion/ven­geance wea­pon-2) could not win the war for Ger­many—the missile was too expen­sive, too com­pli­cated, too inac­curate, and its war­head was too small. That said, a V‑2 could create a crater 65 ft wide by 26 ft deep and eject approxi­mately 3,000 tons of material into the air. Left: On November 26, 1944, the first Allied shipping con­voy sailed through the Scheldt Estuary to the An­twerp docks. V-2s con­tin­ued to fall on the port city. 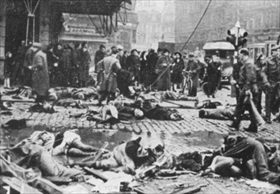 At ten minutes past noon on Novem­ber 27, as the crucial cargoes were being unloaded and moved out of the city to the Allied front, a V‑2 hit a busy inter­section—Teniersplaats (Teniers Square), the geo­graphi­cal cen­ter of Ant­werp—just as a Briti­sh mili­tary con­voy was passing; 157 peo­ple were killed, including 29 service­men in the convoy. 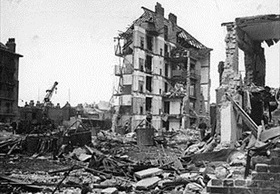 Right: Antwerp was struck 1,610 times by V-2s, followed by Lon­don, at 1,358. Next runner-up was the Bel­gium city of Liège, at 27. This photo­graph shows a ruined neighbor­hood in East London following the explosion of the last V-2 rocket to fall on the British capital, March 27, 1945.